My Drops Jacket is done. I am glad it came out all right because I am not ripping it apart again! It is a little big, but hopefully it won't stretch out too much this time. 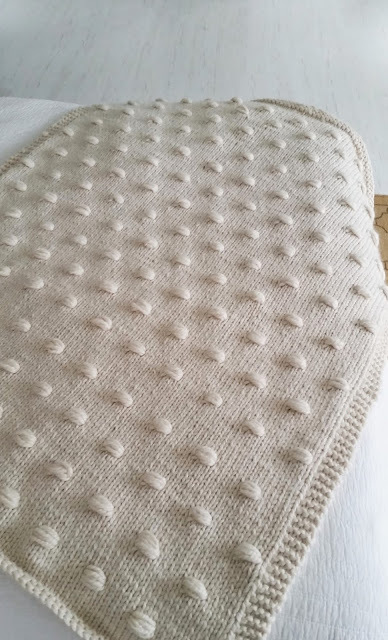 It was a really fast knit and I think I am just glad to have the frogging and knitting out of the way. 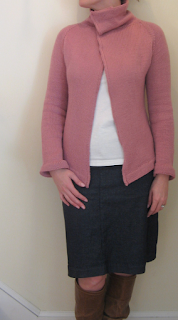 Pattern: Modified Drops Jacket using Canary Knits and Hilary's suggestions. 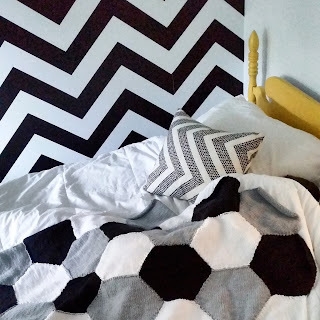 You can find the original pattern here. Yarn: Debbie Bliss Donegal Tweed Chunky, about 8 skeins. Mods: I cast on per Hilary's stitch count. I wish I had done a bit less. I used a bulky weight, and she used a heavy worsted. I picked up every other stitch for the collar, instead skipping every forth stitch. I also added some waist shaping, because I could tell it was going to be big. Lovely! Very nice, I like it much more! Very pretty - I like it. very nice. i love the style and the color. Wow, you knit really fast. I like the Neck Down Hooded Cardigan you knit back in October, 2008. May I ask, do you wear it often? It looks fabulous! I really like your sleeve length, and think it looks nice a bit slouchy. I'm so glad you made this and hope you wear it a lot! Ok, it was good thing that I was sitting down. It is done! I can not believe you knitted this jacket so fast! It looks so great on you! Wow! I love it! Great shape and super color! This makes me want to learn to knit! That sweater is so awesome it makes me want to say a bad word. I loveLOVElove it! And it looks like all your hard work was warranted as the final product looks like a great fit. And the color? OH THE COLOR. Love orange. I love the orange. The pattern is so classy. Lovely! You are a great knitter. I don't have the patience for cardigans, although I dream about them all the time. Congrats! oh yes, I wear that one all the time. that was a really fun knit. I love this sweater...that orange color especially. You are such a speedy knitter! It's lovely, and looks fantastic on you! I'm having a friend here teach me how to knit soon. Can't wait. I'm sure I'll be making dish towels for awhile, but I can't wait til I can create something as beautiful as the things you make! It looks fabulous! And you sure knit that one fast. I love it. Beautiful. No matter what sweater shape that yarn is in, it is still a gorgeous color! Looks great! That was fast! I really like how it turned out and that bit of extra ease doesn't hurt, it looks great, very comfy-cool! You are amazing! I am so glad you rescued that scrumptious yarn-and in under a week!?!? Amazing! You look great! Wow, you are Harry Houdini of sweater transformations. That is so beautiful and stylish on you. Amazing. Very chic! It looks great! love it! it looks super cozy! speedy gonzalez! That was quick! The jacket looks really nice on you-I love that yarn, too. It's gorgeous. It looks beautiful and I can't believe you have finished it! The colour is stunning and the shaping was definitely worth it - especially when you are such a lovely shape yourself! In answer to your question about my 'surface', I have almost finished the back. Now considering I only take it to swimming and tennis lessons I don't think that's too bad. I have more time to focus on it now that I'm free of all commitments! Oh, it's absolutely gorgeous Katie! The colour is amazing and it was well worth the frogging. It's gorgeous, as usual, Katie! It's so beautiful! You're so inspiring. Love the jacket. When I'm done with my socks I want to start a sweater and Iv'e been looking at that one. Good color!! This turned out really beautifully, it looks gorgeous on you! honestly, katie. that piece is GORGEOUS!!!!!!!!!!! Oh wow! That is so beautiful! Really truly beautiful! looks great! hopefully this works for you! That yarn is so pretty and the sweater turned out great! Oh, it is fabulously beautiful. I am sorry you had to work so hard to get it to fit! My latest project was similar... So I certainly know how you feel! oh, katie! it's gorgeous! i hope it doesn't stretch this time. that color is just wonderful!